The 1950s in the United Kingdom seemed very drab, characterized by post war austerity and the feeling that the nation that had produced the world's first Industrial Revolution was now something of a second class citizen in world affairs. There were some bright spots among the gloom, and not everybody's life was equally bleak, because I remember Lady Docker's gold plated Daimler motor car being discussed at length by people for whom ostentation and conspicuous consumption did not seem like an ideal model for economic recovery. The 1951 Festival of Britain cheered people up a bit. Futuristic locations were built south of the River Thames in London, as though to remind the rest of the country that the traditional government neglect of the northern industrial base was still in place. Trying to show that British industry was alive and kicking despite years of under investment by the owners seems absurd with hindsight. A few years later British workers would gain a reputation for low productivity and confrontational industrial relations, notwithstanding the fact that 'relations' implies at least two parties. Social aspirations at all levels tended towards leisured gentrification, and the education system was producing fewer engineers and industrial designers per capita than any other leading industrialized European country. The 1953 Coronation, and the British conquest of Mt. Everest by a local Nepali and a New Zealand former bee keeper, seemed to offer reassurance that indeed there was something to be proud of, even if it was just pomp, circumstance, and minority sports. At the end of ten years of decline following these attempts to revive national pride, after what had been heralded as the dawn of a 'Second Elizabethan Age', John Mander wrote a book asking, 'Great Britain or Little England'? 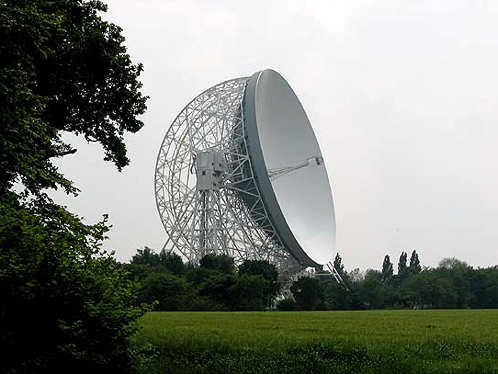 However, even people with a view as jaundiced as my own were excited by the work of Sir Bernard Lovell (1913-), and the building of what was at the time the world's largest steerable radio telescope at Jodrell Bank in Cheshire, England. Looking back, it is difficult to believe that in 1957 everyone in the country who read a newspaper or listened to a wireless news broadcast had heard of the place, and what was being achieved there by Lovell's team. When Peter Turner went there to take today's featured picture for the MaccCam web site he had an Encounter of the Absurd Kind. It is hard to imagine a more bizarre contrast with the world of 1957. I blame television, shorter working hours, holidays abroad, and the Nanny State.